What happens when you have a super smart kid who's beloved dog dies? 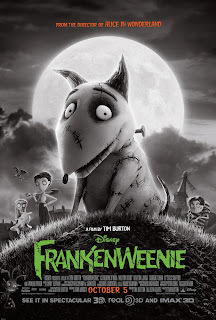 You get Frankenweenie, straight from the mind of Tim Burton. Victor Frankenstein loves his dog Sparky so much that once he's sparked (pun intended) by his science teacher whom the kids call some variation of Rice Krispie, he decides to bring Sparky back to life. Some of you may remember the Frankenweenie short from several years ago. We have it here, its on our copy of The Nightmare Before Christmas. Frankenweenie elaborates on the story to become a full length film. If you've seen the short this entire film should be familiar. Unfortunately depending on how you feel about the short will also color your view on the full length movie. If you loved the short you will probably love this too because its pretty true to the original with just more details. Because making zombie dogs is relatively frowned upon, Victor spends a good portion of the movie either hiding Sparky, or fending off his opportunistic or hyper competitive classmates. Most the actors you've grown to love from previous Burton movies are in this movie providing the voices of the characters. Martin Landau as the science teacher Mr. Rzykruski, Winona Ryder as the goth girl/love interest next door, Martin Short and Catherine O'Hara also lend their voices. Burton makes good films. Is this his best? No, but its a good film nonetheless. The story of Victor and Sparky is heartwarming, the other children all fit into some odd stereotype and while the movie has a set in the 50's feel, there's a funny joke about Pluto not being a planet anymore to bring you into current times. The town of New Holland with its perfect suburbia, over zealous mayor, super competitive kids, mixed bag of weirdos to give you that Frankenstein film is overly theatric. Its in black and white, I wouldn't pay for the 3-D upgrade, the most common affect was a someone's head slightly out of shot that was in 3-D and the pets. This is not a film for the under 6 crowd. It deals with themes like death, not fitting in, angry mobs and the big action sequence in the film has some mildly scary undead pets. I give this movie a matinee. Fans of the short will enjoy this. C1 who never cared for the short gave this a much lower rating than I did. Frankenweenie clocks in just under 90 minutes and is rated PG.